Edgar Young Mullins (1860-1928), was an influential Baptist educator , author, and preacher. He became the fourth president of Southern Theological Seminary from 1899 to 1928. He also served as president of the Southern Baptist Convention from 1921 to 1924. In the introduction Mohler writes of him, “As the Southern Baptist Convention entered the twentieth century, E.Y. Mullins emerged as one of the denomination’s most formative influences. Mullins sought and fulfilled his role as denominational statesman and as the convention’s most articulate theologian. . . Mullins was also the primary architect of the convention’s first official confession of faith, The Baptist Faith and Message, adopted in 1925.” However, Mullins was also a controversial figure and not always appreciated by SBC leaders. In fact, Mohler takes much time to explain how he feels Mullins took the convention and the seminary in compromising directions. Most of all, Mullins was not a Calvinist caused much division over his views on the freedom of the will. 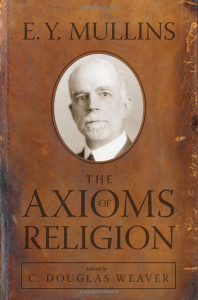 However, in the actual writing called “The Axioms of Religion,” Mullins champions the soul liberty of the individual before God and applies that historic Baptist principle in various ways, primarily against the infant Baptist that was so prevalent in his day. In fact, his critique of infant baptism is one of the best things I’ve read on the subject. For this reason alone the Axioms are worth reading. The second section of the book is a list of eleven selected writings from Mullins on various subjects. The Axioms are worth the price of the book.